There’s a rumor going around that tweens (you know, those kids formerly known as preteens, who are currently hovering between the ages of 8 and 12) are actually physically able to put down the YouTube videos and watch a real television show with a plot. I swear. It’s possible; I’ve seen it done. But what to watch? Thankfully, those mind-numbing Caillou days are over (if you were wondering, yes, Caillou is still 4 years old and all signs are pointing to him staying this age for all of eternity). Now that your kids have outgrown boring preschool TV, is there a show out there that you can actually enjoy together? It turns out there are plenty. 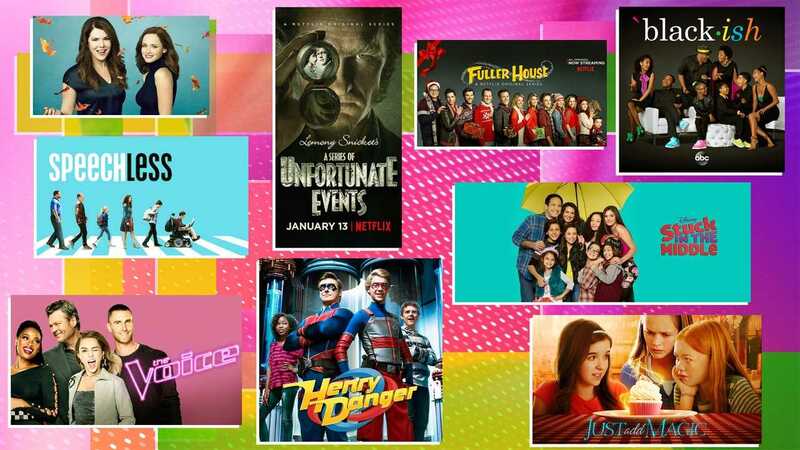 Ahead, we’ve rounded up 12 kid-appropriate but still grown-up-engaging shows that you and your tween will both enjoy. And if they’re worried all that compelling TV narrative will be a poor replacement for YouTube slime videos — well, just assure them they can watch those another time. There are so many terrific reality shows that are not the Real Housewives or the Kardashians. The Voice is my absolute favorite because the judges (including hottie musician Adam Levine and professional boyfriend Blake Shelton) only playfully make fun of each other — and never mock the contestants, which is good because tweens certainly don’t need another lesson in snark and attitude. Plus, the contestants on The Voice have amazing vocal talent; the best part of the show is the blind auditions in the beginning, so definitely don’t skip those. But if singing isn’t your family’s thing, there are tons of other mostly wholesome reality shows you can enjoy together depending on your tween’s interests — from Shark Tank (for the future entrepreneurs) to anything on the Food Network (for chefs in training) to HGTV (for up-and-coming real-estate tycoons). Family favorites include American Ninja Warrior, America’s Got Talent, Dancing with the Stars, Survivor and Project Runway. This is a smart comedy about a teenage boy with cerebral palsy who is in a wheelchair and can’t communicate verbally. He uses a laser pointer and a communication board to express himself. Any show that exposes kids to people with special needs is worth checking out. Plus, I love Minnie Driver as the mom. You may remember this show from your younger years, and it’s a great one to revisit. It’s about a fast-talking, coffee-loving mother and daughter. Although the premise is medium-mature (the mom had her daughter when she was just 16), the show is truly funny and endearing. Plus, you can get a peek at Milo Ventimiglia (now starring in This Is Us) when he was teenage bad boy Jess. If you’ve got Full House nostalgia from the ’80s, this is a good one to try. It focuses on a grown-up D.J. Tanner raising her three boys with the help of her sister Stephanie and old friend Kimmy. Yes, it’s corny and cheesy, but also sweet. Plus, John Stamos (who doesn’t really age) usually pops by — isn’t that reason enough to watch? Comedian and talk show host Ellen DeGeneres just makes you feel better about life. She’s fun, quirky and loves to dance, and her talk show features celebrity interviews and funny clips from the internet. This is a really positive, feel-good show to watch with your tweens. Keep in mind, though: Not every segment is necessarily appropriate for young viewers, so you may want pay attention to the content. This series is based on the books by Lemony Snicket (aka Daniel Handler) and it’s definitely a bit dark. It’s about three orphaned children who are sent to live with their closest relative (played by the talented Neil Patrick Harris) who goes about making their lives miserable. Luckily, there is some humor too. This is for the older tween who likes spooky shows. This is a fun comedy about life as a young teen. The story revolves around 13-year-old Andi Mack, whose life is rocked when her big sister comes back home. And I mean rocked. Like Gilmore Girls, this show’s premise deals with teen pregnancy, so you have to be comfortable with that. But it’s also about going outside your comfort zone and taking some chances in life. This sitcom is about a black family living in a mostly white, upper-class neighborhood. The dad, who grew up in a rougher area, worries that his four kids are assimilating too well into the wealthy community — and that it’s turning them “black-ish.” This show is a great way to open up a dialogue with your tweens about race and diversity. Every middle child is probably destined to love this show. It centers around 12-year-old Harley Diaz, who is the fourth in a family of seven kids. Yes, seven. There’s a lot of chaos, mess and humor in this family-friendly sitcom — and I always appreciate a show that’s about imperfection. It’s worth watching whether you’re part of a small or big family. Warning: You will not glean any great messages about life from this silly show about a superhero (Captain Man) and his teen sidekick (Kid Danger). But there is just something charming about it. Although Kid Danger’s little sister, Piper, is beyond bratty, so you sort of have to ignore her antics and point out to your children that they must never behave like her. There’s a lot of crime-fighting too, but it’s all good-natured and ridiculous. No fear factor here. This is a show about three best friends who discover a magical cookbook — and the strange things (good and bad) that follow. There is a lot of mystery, but it’s not super-scary. I love the focus on friendships, a multigenerational family (the grandmother is a key part of the story) and cooking. This is a show that looks like a reality show but is actually a scripted drama. It focuses on the kids at a performing arts high school. (Did you just start singing the Fame soundtrack? Then this program could be for you.) These talented kids have to deal with the highs and lows of competition while building friendships and navigating the challenges of high school.